Enjoy high-quality audio on the go with the Pixel Buds from Google. These sleek-looking earbuds use Bluetooth technology to stream digital music and audio from compatible devices, including select smartphones and tablets. More than just headphones, the Pixel Buds also feature an integrated microphone, so you can take calls, dictate text messages, and use voice commands with compatible devices. Pixel Buds support Google Translate, so if you have a compatible smartphone with the Google Translate app, you can get real-time language translation for select languages. The Pixel Buds feature an ergonomic design that allows for long-lasting comfort and an on-device touchpad for conveniently navigating your music and playback. Its rechargeable battery provides up to 5 hours of playback and the included travel case will recharge the buds while they're stored inside. A 10-minute charge provides up to an hour of listening time. The travel case also allows the Pixel Buds to fast-pair with compatible Android devices; simply open the charging case near your phone running Android 7.0 or later. Note: Total listening times are approximate and are measured using fully charged Google Pixel Buds and a fully charged case for the first Google Pixel Buds re-charge cycle. Actual results may vary. Google Pixel Buds battery testing conducted in September 2017 on pre-production Pixel Buds connected to a pre-production Pixel 2 phone and in Spring 2018 on production hardware with the most recent software. Google Pixel Buds are designed for high-quality audio and fit comfortably in your ear. 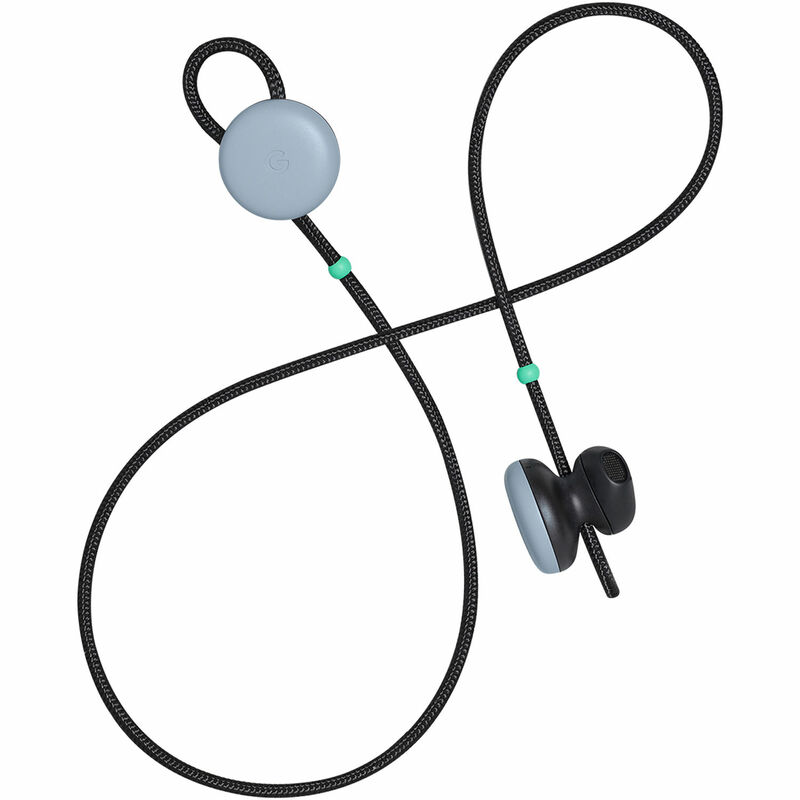 An adjustable loop on each earbud provides for a stable fit in your ears. When you use the Pixel Buds and your Pixel smartphone, you can get real-time translation with Google Translate and select languages. The Pixel Buds provide up to 5 hours of listening time on a full battery and the included charge case adds enough additional charges to get you up to 24 hours of battery life. A quick 10-minute charge will give you up to an hour of listening time. Use the touchpad to activate Google Assistant and quickly access music, messages, and more. Tap to play and pause, swipe to change the volume. Box Dimensions (LxWxH) 4.1 x 4.1 x 2.8"
Pixel Buds (Kinda Blue) is rated 5.0 out of 5 by 1. Rated 5 out of 5 by Krista from Totally Awesome! We received the product and color we wanted after two days of ordering at no extra charge.....just in time for Christmas! We will definitely shop B&H again. Happy New Year!